SysInfo Windows Data Recovery tool is the best data recovery software for recovering data from corrupt as well as formatted hard disk drives of Windows system. You may lose data due to accidental deletion or corruption. You can download free demo version of SysInfo Windows Data Recovery tool.Windows Data Recovery is World’s Most Reliable Software to Recover Lost Data and Deleted Files. Windows Data Recovery of SysInfoTools is a complete solution to recover data from damaged partition and external storage devices. This software is a complete package to fix all Windows data corruption errors and recover data from corrupt, damaged or inaccessible hard drives. It offers numerous exciting features to recover all lost files, deleted photos, and memorable videos, important office documents, etc without making any alteration to their original format of the files. Key features of SysInfo Windows Data Recovery tool are: * Restore data from damaged or corrupt hard drive; * Support hard disk data recovery after accidental formation; * Volumes and drives containing both FAT as well as NTFS file systems, are supported; * Support both popular partition tables, i.e. master boot record and GUID partition table; * Standard and Advance modes for scanning corrupt physical drives; * New custom volume can be added to the list in case of physical drive recovery; * RAW recovery is enabled for recovering maximum possible data from corrupt drive; * Users are enabled to add new file signatures with RAW recovery mode; * Auto-display the information of selected drive or volume before scanning process; * Two recovery modes in case of FAT data recovery: Standard and Advanced; * Three recovery modes in case of NTFS data recovery: Standard, Advanced and Deep; * Maximum file systems can be found in the volume with advanced recovery mode; * Preview of recovered data, i.e. files and folders, is shown in the tree-structure; * Users are allowed to save the specific files at any location on their system; * Auto-search the files (multiple files at a time) in the system directory; * Highly compatible with all major versions of Windows-based operating systems including Win 10. Changes: This is a new release of SysInfoTools Sotware, therefore no changes have been made so far. Press release: Smart Windows Data Recovery software is available online with free demo version for trial purpose. If you've lost data from your Windows hard disk containing FAT and NTFS file systems, Windows Data Recovery software is the best data recovery solution for you. Via this software, you can easily restore maximum possible data in their original form. The trial version of SysInfoTools Windows Data Recovery tool can be freely distributed over the Internet in an uncharged and unchanged form. 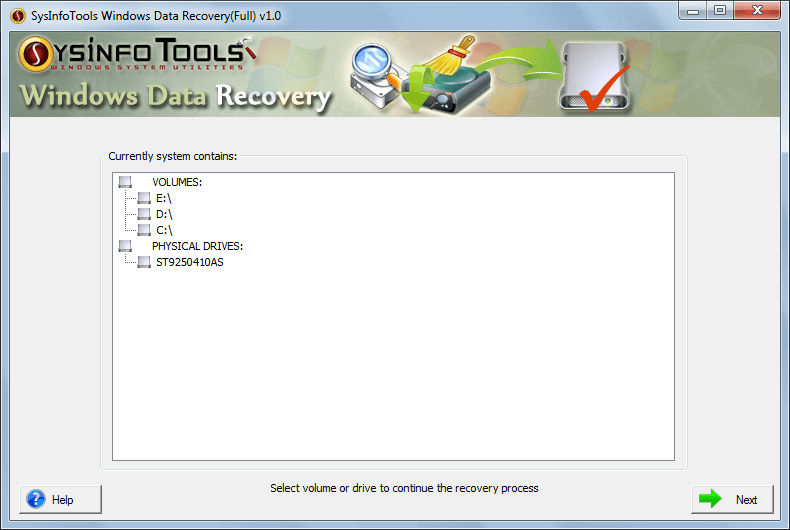 SysInfoTools Windows Data Recovery Copyright by SysInfoTools Data Recovery. Your Agreement to this License You should carefully read the following terms and conditions before using, installing or distributing this software, unless you have a different license agreement signed by SysInfoTools Data Recovery.